Setting eclipse: Annular eclipse at sunset squashes the Sun. 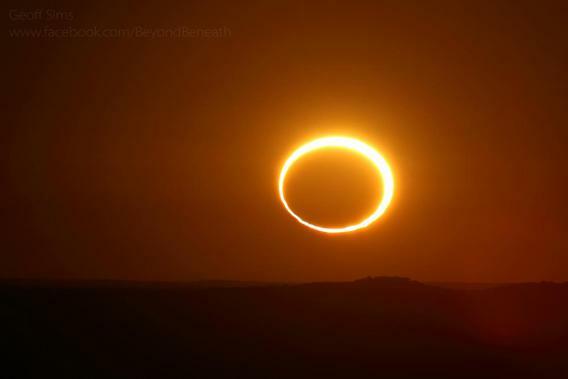 The rising Sun, eclipsed by the Moon, with both flattened due to atmospheric distortion. Click to penumbranate. This was taken mere hours ago as I write this by photographer Geoffrey Sims, who was about 200 kilometers (120 miles) from Newman in Western Australia to watch the May 9/10 annular solar eclipse (if that location sounds familiar, it was where Colin Legg took the amazing Eta Aquarids photo I had on the blog the other day; Legg and Sims are working together on all this). If Sims’ name sounds familiar, that’s because he took an amazing series of photos of the 2012 solar eclipse I featured here. But this one is even better. On average, the Sun and Moon are the same size in the sky, but the Moon’s orbit is an ellipse, and it happened to be near the farthest point on it orbit (called apogee) when it passed in front of the Sun. That made it appear smaller, so it couldn’t cover the entire Sun’s disk, leaving the “ring of fire” around the silhouetted Moon. But Sims caught the eclipse near sunrise*, when the Moon and Sun were on the horizon. Atmospheric effects bend the light from the Sun, squashing it, and making this already weird eclipse that much more bizarre. Sims promised me he has more pictures coming, so I’m excited to see what he has. If they’re anything like this, they’ll be fun to see. Tip o’ the welder’s goggles to Michael Zeilik at Eclipse-Maps for the link! Correction (May 10, 00:04 UTC): Oops. I originally said this was at sunset, but it was actually at sunrise. I wrote this with the Sun setting outside my western-facing office window, and that threw me!